Glenavon assistant manager Paul Millar will be hoping his side bounce back against Crusaders on Saturday after Tuesday night’s 1-0 defeat to Carrick Rangers in the League Cup semi-final. That was a game that the Lurgan Blues were supposed to win but things did not go to plan. 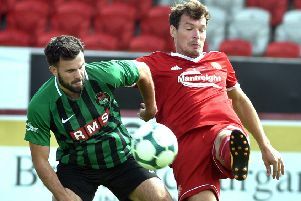 But Millar is still backing the club’s young guns - Rhys Marshall and Mark Sykes - to maintain that form despite forthcoming fixtures with back-to-back league champions Crusaders, derby rivals Portadown and in-form Cliftonville before the close of 2016. “They bring a real freshness to the side, that is how I would describe it all,” said Millar. “Both can do everything and we are delighted with the form of Rhys and Mark. “With Rhys now 21 years old and Mark only 19 it sends out a great message to the rest of the young players at the club. “Rhys is so reliable and consistent in any position, to the point that sometimes people forget or take it for granted. “Over the past few years Mark has progressed and made that position his own. “We have no fears over playing both together in such an important area of the pitch. “They both have that energy which makes life difficult for the opposition.